The International Center for Documentary Arts presents the new exhibition Changing Beijing: an Olympic Transition. The event will be hosted by the Stolen Buick Studio located in the East Village at 1303 West Chicago Avenue in Chicago. Changing Beijing features color photographs by husband and wife photojournalist team Alexandra and Michael Buxbaum who documented the transformation of an ancient city in preparation for the up-coming 2008 Beijing Olympics. In the past most Beijing residents lived in Hutongs which are ancient city lanes, or neighborhoods, built mostly during the Yuan, Ming, and Qing Dynasties. These lanes, or passageways, are formed by building complexes called Siheyuan or a "central courtyard" surrounded by four buildings. Siheyuan varied in size and design according to social status and the rules of Feng Shei. The Hutongs and Siheyuan are disappearing at a faster and faster rate with each government modernized attempt. Fifty years ago there about 3,000 Hutongs left in Beijing. 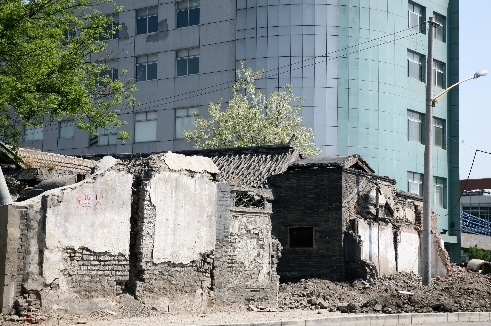 In 2006 there were only about 1,000 left and since then, in preparation for the Olympics, more than half of the remaining Hutongs were destroyed by modernization. Over 600,000 people have been displaced as the Hutong are replaced by modern flats, shopping malls and hotels. All property is state owned and individuals have a limited say in the matter. City planners want Beijing to look modern for the 2008 Olympics, and the Hutongs, often seen as backwards, are not what they want to present to the world in large quantities. While there is government preservation of Hutong these efforts are limited to only a few locations. "The photographs we selected for this exhibition portray something more than just the incredible architectural loss to Beijing and the world," says Alexandra Buxbaum, "they help illustrate how government modernization attempts have changed an entire culture, an entire way of life that has existed for more than a thousand years." One photo shows us a small group of men gathered around an undersized table playing Mahjong in a condemned Hutong. In another image we see a half demolished Siheyuan with signs of former life - clothes left behind hanging in a doorway. The selected exhibition photos highlight the International Center for Documentary Arts' mission to create and display works that feature the connection between people throughout the world and the streets that they live, work and play in. The goal of the Center is to allow viewers to see a perspective of everyday life that most people overlook in their rush to get somewhere else - whether in far away places such as Beijing, or just around the block from your home. Visit The International Center for Documentary Arts Today! Please contact us for details on viewing the archives.